Heater Gas Type This option allows you to select the type of fuel you want the heater setup for. Options include propane and natural gas. Heater Elevation If you live at an elevation above 5000', Sterling heaters need to be equipped for high altitude. High altitude heaters are built to order and shipped direct from Sterling. The average ship time is 2 to 3 weeks, and there is an additional $59 charge. Stainless Steel Heat Exchanger Upgrade If the heater will be in a corrosive environment, upgrading to a stainless steel heat exchanger will increase the life of the heater. Units with stainless steel heat exchangers ship direct from Sterling. The average ship time is 2 to 3 weeks. Must be ordered with heater. Heaters with a two-stage gas valve start on the 1st stage at half output and only switch to the 2nd stage, full output, if the temperature inside the room continues to drop. This allows the heater to run more efficiently saving gas and money. This option is NOT available for models GG30 and GG45. Units with 2 stage valves ship direct from Sterling. The average ship time is 2 to 3 weeks. Must be ordered with heater. NOTE: A 2 stage thermostat is needed if you upgrade to the 2 stage gas valve. 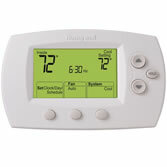 This programmable thermostat offers 2 stage heating control. Weekday/Weekend programming - use as a 5-1-1 (Weekdays, Saturday, Sunday) or 5-2 (Weekdays, Weekend) programmable thermostat, whichever best fits your lifestyle. Can be powered by appliance and/or batteries. Wiring required. - Large, clear, backlit display - easy to read in various lighting conditions. The two stage weatherproof thermostat can be used to automatically open motorized louvers before cutting on an exhaust fan(s), stage multiple fan or heater systems, or operate multiple speed exhaust fans that do not already have a built-in control. This model has two SPDT switches. Temperature coil is stainless steel to prevent corrosion. Wiring required.